To be honest, I’m not quite sure what to do with an eggplant. It has such a pretty color and shape and is used in dishes such as ratatouille and eggplant parmesan, but whenever I try to incorporate this vegetable into a dish it just doesn’t work. The eggplant itself always ends up kind of squishy and well, just not very appealing. It does have quite a few health benefits, though, so it’s well worth your while to figure out how to cook this purple beauty. 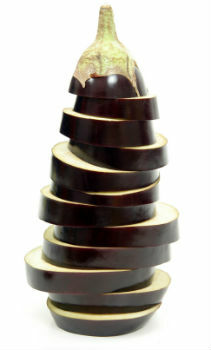 Heart health – animal studies show that eggplant may help lower overall cholesterol and improve blood flow. Brain health – contains nasunin which may help promote healthy brain function by protecting brain fats through scavenging free radicals that target brain lipids. Digestion and Weight Loss – 1 cup of eggplant contains about 8% of the daily recommended dietary fiber and that 1 cup, cubed and cooked, contains only 35 calories. Bone health – Contains many of the minerals needed to maintain strong, healthy bones; manganese, potassium, magnesium, and copper. Brush 1/4-inch-thick eggplant planks with vegetable oil and broil, turning once, until tender. Drizzle with a dressing made with equal parts soy sauce, honey, toasted sesame oil and rice vinegar seasoned with freshly grated ginger. Top with toasted sesame seeds.